PDB rendering based on 1k78. 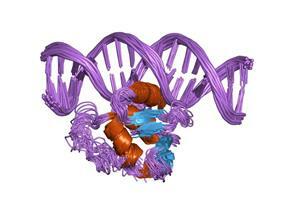 Protein C-ets-2 is a protein that in humans is encoded by the ETS2 gene. 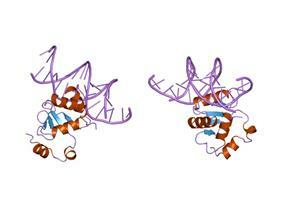 The protein encoded by this gene belongs to the ETS family of transcription factors. ^ a b Dwyer J, Li H, Xu D, Liu JP (Nov 2007). "Transcriptional regulation of telomerase activity: roles of the Ets transcription factor family". Ann N Y Acad Sci 1114 (1): 36–47. ^ "Entrez Gene: ETS2 V-ets erythroblastosis virus E26 oncogene homolog 2 (avian)". ^ Wei, Guo; Schaffner Alicia Erbe; Baker Kimberly M; Mansky Kim C; Ostrowski Michael C (2003). "Ets-2 interacts with co-repressor BS69 to repress target gene expression". Anticancer Res. (Greece) 23 (3A): 2173–8. ^ a b Basuyaux, J P; Ferreira E; Stéhelin D; Butticè G (Oct 1997). "The Ets transcription factors interact with each other and with the c-Fos/c-Jun complex via distinct protein domains in a DNA-dependent and -independent manner". J. Biol. Chem. (UNITED STATES) 272 (42): 26188–95. ^ Kasten, M; Giordano A (Apr 2001). "Cdk10, a Cdc2-related kinase, associates with the Ets2 transcription factor and modulates its transactivation activity". Oncogene (England) 20 (15): 1832–8. ^ Dudek H, Tantravahi RV, Rao VN, Reddy ES, Reddy EP (Feb 1992). "Myb and Ets proteins cooperate in transcriptional activation of the mim-1 promoter". Proc Natl Acad Sci U S A 89 (4): 1291–5. Boulukos KE, Pognonec P, Sariban E, et al. (1990). "Rapid and transient expression of Ets2 in mature macrophages following stimulation with cMGF, LPS, and PKC activators.". Genes Dev. 4 (3): 401–9. Watson DK, Mavrothalassitis GJ, Jorcyk CL, et al. (1991). "Molecular organization and differential polyadenylation sites of the human ETS2 gene.". Oncogene 5 (10): 1521–7. Watson DK, McWilliams MJ, Lapis P, et al. (1988). 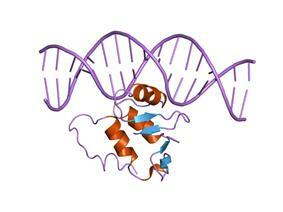 "Mammalian ets-1 and ets-2 genes encode highly conserved proteins.". Proc. Natl. Acad. Sci. U.S.A. 85 (21): 7862–6. Watson DK, McWilliams-Smith MJ, Nunn MF, et al. (1985). "The ets sequence from the transforming gene of avian erythroblastosis virus, E26, has unique domains on human chromosomes 11 and 21: both loci are transcriptionally active.". Proc. Natl. Acad. Sci. U.S.A. 82 (21): 7294–8. Le Beau MM, Rowley JD, Sacchi N, et al. (1986). "Hu-ets-2 is translocated to chromosome 8 in the t(8;21) in acute myelogenous leukemia.". Cancer Genet. Cytogenet. 23 (3): 269–74. Fujiwara S, Fisher RJ, Seth A, et al. (1988). "Characterization and localization of the products of the human homologs of the v-ets oncogene.". 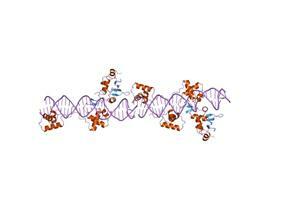 Oncogene 2 (2): 99–103. Sumarsono SH, Wilson TJ, Tymms MJ, et al. (1996). "Down's syndrome-like skeletal abnormalities in Ets2 transgenic mice.". Nature 379 (6565): 534–7. Basuyaux JP, Ferreira E, Stéhelin D, Butticè G (1997). "The Ets transcription factors interact with each other and with the c-Fos/c-Jun complex via distinct protein domains in a DNA-dependent and -independent manner.". J. Biol. Chem. 272 (42): 26188–95. Blumenthal SG, Aichele G, Wirth T, et al. (1999). "Regulation of the human interleukin-5 promoter by Ets transcription factors. Ets1 and Ets2, but not Elf-1, cooperate with GATA3 and HTLV-I Tax1.". J. Biol. Chem. 274 (18): 12910–6. Jayaraman G, Srinivas R, Duggan C, et al. (1999). "p300/cAMP-responsive element-binding protein interactions with ets-1 and ets-2 in the transcriptional activation of the human stromelysin promoter.". J. Biol. Chem. 274 (24): 17342–52. Kilpatrick LM, Kola I, Salamonsen LA (1999). "Transcription factors Ets1, Ets2, and Elf1 exhibit differential localization in human endometrium across the menstrual cycle and alternate isoforms in cultured endometrial cells.". Biol. Reprod. 61 (1): 120–6. Rameil P, Lécine P, Ghysdael J, et al. (2000). "IL-2 and long-term T cell activation induce physical and functional interaction between STAT5 and ETS transcription factors in human T cells.". Oncogene 19 (17): 2086–97. Hattori M, Fujiyama A, Taylor TD, et al. (2000). "The DNA sequence of human chromosome 21.". Nature 405 (6784): 311–9. Park US, Park SK, Lee YI, et al. (2000). "Hepatitis B virus-X protein upregulates the expression of p21waf1/cip1 and prolongs G1-->S transition via a p53-independent pathway in human hepatoma cells.". Oncogene 19 (30): 3384–94. Pastorcic M, Das HK (2001). "Regulation of transcription of the human presenilin-1 gene by ets transcription factors and the p53 protooncogene.". J. Biol. Chem. 275 (45): 34938–45. Smith JL, Schaffner AE, Hofmeister JK, et al. (2000). "ets-2 is a target for an akt (Protein kinase B)/jun N-terminal kinase signaling pathway in macrophages of motheaten-viable mutant mice.". Mol. Cell. Biol. 20 (21): 8026–34. Mullick J, Anandatheerthavarada HK, Amuthan G, et al. (2001). "Physical interaction and functional synergy between glucocorticoid receptor and Ets2 proteins for transcription activation of the rat cytochrome P-450c27 promoter.". J. Biol. Chem. 276 (21): 18007–17. Kasten M, Giordano A (2001). "Cdk10, a Cdc2-related kinase, associates with the Ets2 transcription factor and modulates its transactivation activity.". Oncogene 20 (15): 1832–8. Ezashi T, Ghosh D, Roberts RM (2001). "Repression of Ets-2-induced transactivation of the tau interferon promoter by Oct-4.". Mol. Cell. Biol. 21 (23): 7883–91. Xu XR, Huang J, Xu ZG, et al. (2002). "Insight into hepatocellular carcinogenesis at transcriptome level by comparing gene expression profiles of hepatocellular carcinoma with those of corresponding noncancerous liver.". Proc. Natl. Acad. Sci. U.S.A. 98 (26): 15089–94. Islas, J. F.; Liu, Y.; Weng, K. -C.; Robertson, M. J.; Zhang, S.; Prejusa, A.; Harger, J.; Tikhomirova, D.; Chopra, M.; Iyer, D.; Mercola, M.; Oshima, R. G.; Willerson, J. T.; Potaman, V. N.; Schwartz, R. J. (2012). "Transcription factors ETS2 and MESP1 transdifferentiate human dermal fibroblasts into cardiac progenitors". Proceedings of the National Academy of Sciences 109 (32): 13016–13021.